Its brash, it’s raunchy and so politically incorrect that it might even shock you, but LEGIT is absolutely hilarious, touching and downright honest, filled with emotion and empathy. It’s one of those shows you will either love or hate, and I love it! 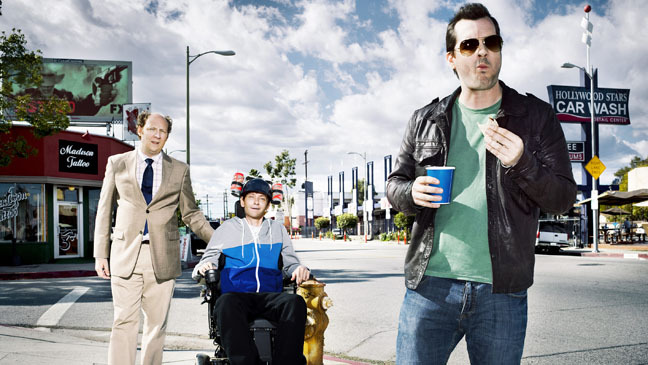 The story follows Jim Jefferies who is on a quest to become legitimate in life; he receives encouragement from his friend and roommate Steve Nugent (Dan Bakkedahl) and Steve’s brother Billy Nugent (DJ Qualls) who has muscular dystrophy. I don’t want to give too much away here in case you haven’t seen it. The cast is great especially DJ Qualls he’s simply amazing. This edgy show airs on the American cable television network FX and if you are not easily offended it’s definitely worth checking out. This entry was posted in TV and tagged Comedy, Entertainment, FX, Jim Jefferies, Legit. Bookmark the permalink.